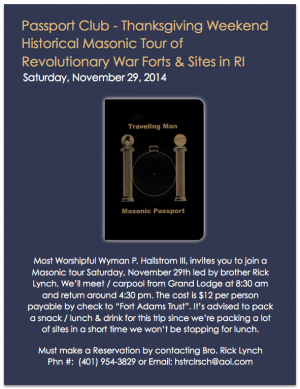 Most Worshipful Wyman P. Hallstrom, III invites you to join a Masonic tour on Saturday, November 29th led by brother Rick Lynch. The tour will begin promptly at 8:30 AM from the Grand Lodge parking lot and proceed as a car-pool convoy, returning by 4:30 PM to the Grand Lodge. Car-pooling is encouraged, as some sites will have parking limitations. Exact addresses will be provided for each site visit so that drivers can use their GPS units and not worry about following in a long automobile caravan. The trip will require a fair amount of walking and a little uphill walking. RI Freemasons played an important part in the Revolutionary War. Brothers from St. John’s Lodge Newport and St. Johns Lodge Providence served as officers in the Continental Army. They played important roles in many of the battles during the war and their efforts will be explained. Rhode Island has many forts that were built during this period to protect the republic from the British, of which some still survive today. Some are well known and others have been lost to time yet their ruins still exist on the landscape. The following sites listed will be visited on the trip and the final stop will be at the impressive Fort Adams in Newport. Here we will receive a behind the scenes tour of the fort and all its architecture. 9 Forts were known to have existed in Providence along shoreline. Only the remains of a couple exist and our first stop will be to one of these; Fort Hill located along Veteran’s Parkway in East Providence. We will also visit the city overlook site along the parkway where we will view the site of Fort Hiram, and several of the other forts. The Fort Hiram was built following the in War in 1814 by 230 Freemasons under the direction of the Grand Master and Grand officers. It was a breastwork built at India Point, measuring 430’ long by 10’ wide by 5’ high all built in 1 day! Our next stop will take us to the hilltop site of Fort Barton in Tiverton, named after brother and Colonel William Barton of St Johns Lodge Providence. Brother Barton is best known for his capture of Major General Richard Prescott the commander of all British troops on the island. The fort breastworks are still visible and the park offers an observation tower with commanding views of the mid and upper waters of Narragansett Bay. We then move on to nearby site of Fort Butts in Portsmouth, almost across the street from the Eureka Temple. This is a totally undeveloped site with the original ruins and artifacts known to very few. Fort Butts was the site of the major “Battle of Rhode Island”. We will also stop at the nearby overlook on West Main Rd. where interpretive signs tell of the Battle and the several prominent landmarks associated with it. From Fort Butts we proceed over to the island of Jamestown where we will visit the “Conanicut Battery”. This Battery/Fort was erected with its cannons to defend the “West Passage” of the bay. Built by the local militia for defense but lost during the occupation of Jamestown by the British and then retaken with the aid of the French. Also located here are 4 triangulation stations used during WW II for the firing of all the “heavy” guns of nearby Ft. Wetherill and Ft. Dumpling. Fort Adams in Newport will be our last stop and most informative. Built by 300 Irish Masons brought to America by the US Army during the period 1825-1838. Alexander MacGregor a Scottish operative Freemason was employed and given oversight of the Fort’s masonry construction. We will have a private guided tour of the entire fort and the “Southern Battery”. Ft. Adams was the 2nd largest coastline defense of WW II, second only to the slightly larger Ft. Munroe in Virginia. The Fort was started during the Revolutionary War and was in service until the late 1950s. The construction is most impressive with medieval and modern methods employed. Built by masons and Freemasons we will view the original cornerstone laid deep in one of the many tunnels as well as view the “Mason’s Marks” left on many of the stones. Our guide for the tour will be historian and fort archivist, Matthew ‘Doc’ Perry, who incidentally has recently petitioned St. Johns Lodge Portsmouth to join the Craft. This will be our last stop of the tour. From here most will head home or return to Grand Lodge to reclaim your cars. There will be a fee of $12.00 per adult to join the tour. The proceeds will go to the Fort Adams Trust and specifically the museum and archive fund. This is the normal fee charged for a visit to the park. I ask that you make out checks to the “Fort Adams Trust”. Checks are preferred to cash. It is necessary that you make a reservation to join the trip, as I will be providing a guide booklet to the sites we will be visiting. Everyone attending will receive one and I need a count several days in advance to get them printed. Because we will have an aggressive schedule, I ask that each person attending bring a snack or lunch and drinks for the trip. We will not be able to afford the time to stop for lunch as daylight hours are short this time of the year and we need to be done by 4:00 PM. I hope you can join us on this exciting trip, which I hope will be the first of many future “Masonic” field trips in the coming year. If you are not yet tired and seek more knowledge, I would also invite you to travel directly to Charity Lodge after the trip where we will be hosting a “Star Party” that evening on behalf of our Youth Committee. Several telescopes will be set up to view the heavens. It will begin at approximately 6:00 PM. In the event of cloudy skies there will also be a presentation on the “1947 Roswell UFO Incident”.